One person was killed while two were injured after a portion of an under-construction, three-story building at the corner of H. Grupo Street and CPG Avenue in Tagbilaran City collapsed on Wednesday afternoon. A security guard at the construction site, Jun dela Torre, identified the fatality as Hilbert Morales, a native of Zamboanga Sibugay, and the injured persons as William Apatan and Christopher Catigtig. According to construction workers, they were removing scaffolding and gathering plywood when a 100-meter long beam suddenly collapsed and fell at around 5 p.m.
FO2 Dennis Caluña of the Tagbilaran City Fire Station, which helped in the retrieval operations, said that Morales was pinned down by trusses and concrete. Morales died on the spot, he added. 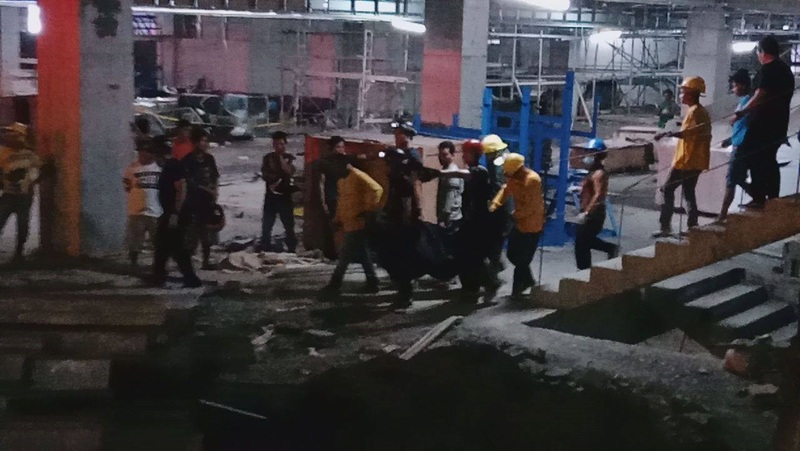 Abatan, the construction lead man, suffered a broken leg after he jumped from the second floor when the beam collapsed, construction worker Ernesto Ramiro said, adding that they initially thought that an earthquake hit the area. Meanwhile, Catigtig suffered bruises all over his body after concrete fell on him. Authorities including the Bureau of Fire Protection and the Provincial Disaster Risk Reduction and Management office continued to conduct investigations on the incident. The said building, located in the former site of the Holy Name University, was leased out to the Alturas Group of Companies. Construction of the building was overseen by the Dakay Construction Company.